Neil Robertson's 100th century break of the season does not compare with a 147 break at the World Championship, says beaten opponent Judd Trump. 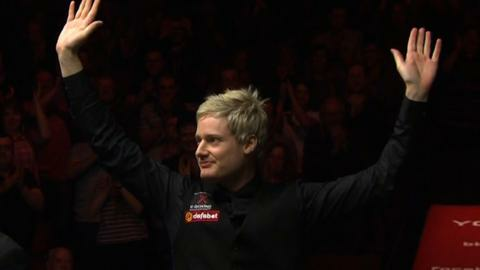 Robertson became the first player to reach the milestone on his way at the Crucible. Trump headed straight out of the arena to refocus as Robertson celebrated his landmark century in the 24th frame. "If it was a maximum, I'd have gone over and shook his hand," said Trump, who held the previous record of 61. He told BBC Radio 5 live: "Although it's a brilliant achievement, 100 centuries doesn't mean anything to me. "I just wanted to get on and win the game. I congratulated him at the end of the match and wished him luck, so that's all I can do." He added that he did not regard the feat as significant as a maximum break but admitted: "In other people's eyes, it may be. "I've got no hard feelings against Neil. I get on with him and there was nothing in it. I just wanted to try and win the match and I thought my best way of doing that was getting out of the arena as quickly as possible." Australia's Robertson, 32, had failed to make a century earlier in the tournament when reaching 99 and celebrated vigorously after potting a green in the 24th frame to take him to 101. Trump held the previous best with 61 centuries last season. Robertson was in no doubt that a maximum break was not as significant a feat as the century of centuries. "I've made a couple of 147s and it's nowhere near the same achievement, absolutely nowhere near," said the world number one. He felt Trump's comments may have been down to the disappointment of losing in the quarter-finals after establishing a "really big lead". He added: "I put him under pressure and sometimes people say things they don't really mean. I get along with him really well, it's fine. "He can say what he does after the matches but he wished me well for the semi-final. It's very hard to come in here after being so disappointed with the loss and be happy about it and congratulate me. "The crowd were going ballistic and he just wanted to get out of there. I've been in the Crucible when a couple of 147s were made and the roar was nothing like what I received. "I don't know if I would have shaken my hand either if I were Judd - you've just got to get out of there and refocus." Robertson, the 2010 champion, faces Mark Selby in the semi-finals.